Attacker Harry Cornick is targeting a decent run in the FA Cup this year ahead of Town’s first round clash against Portsmouth tomorrow. 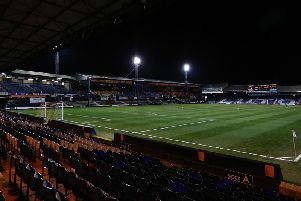 The Hatters have home advantage against their League One opponents and Cornick wants Luton to make their way through to the third round at least, where they could take on one of the big boys. He said: “It’s a good competition to try and get far in and you always want to get to the third round, try and get a big club. Cornick has had a good personal history in the competition during his career, as he made his Bournemouth debut during the 5-1 third round victory at Rotherham United in January 2015. There, he replaced Junior Stanislas after 71 minutes for what was his one and only appearance for the Cherries, while he was also part of the Yeovil side who beat Stevenage 1-0 in the second round the following season. Cornick continued: “Making my debut for Bournemouth is what every kid dreams of, so it was nice to do that in the FA Cup. “It gives a chance for some of the younger players to play in the top team too. Although only 22 years of age, Cornick still has good memories of the competition during his younger days,saying “You always watch it as a kid. “All the games are now on Sky Sports, but it’s always the one on the BBC as they still have a few games on. “So it’s the one everyone can watch really, it’s a good competition and everyone wants to go far in it. “I think my first memory would be Chelsea losing to Arsenal 2-0, Ray Parlour scored. “I was a Chelsea fan, so that was the bad memory, but the first one I think." On the challenges of trying to beat a Portsmouth side who won League Two last year, Cornick continued: “They’re a good team, no two ways about it, so hopefully we can do what they did last year and get promoted from League Two. Although he’d like a run in the cup, Cornick knows what the main aim is for his Hatters team-mates this team, being in Portsmouth's shoes this time next term. He added: “This season, at the end of the day, we want to be a League One side, that’s the main priority. "We want to do well in the FA Cup, get through to the next round, but U think we need to get promoted.